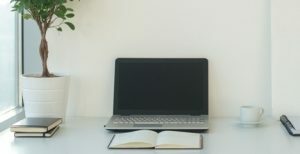 Spend 4 minutes clutter-clearing your desk at the end of each day, and you will start the next day feeling focused, energised and organised, and will probably be more productive. Spend another 1 minute writing a To-Do list and put a tick by the priorities, and you will have a tidy, organised mind as well as a clear desk. Being faced with a messy desk first thing in the morning can sap your energy and lower your morale and motivation, and it can also mess-up your thinking. Before you get to the daily 5-minute desk and mind workout, you will need to allocate a longer session of weeding-out and re-arranging. Then, hopefully, you won’t need to do this again. Take a long look at your desk top. Remove anything that is not needed on there, such as papers, stationery, books, photos, office tools. Throw away, or put them somewhere else for the moment. Clear out your desk drawers. Chuck anything not needed. Use the top drawer for current non-priority projects, separated into labelled folders. Use the other drawers for stationery and tools such as pens, stapler, hole punch etc. On the desk top. Your priority project, your To-Do list, your computer, a pen, a notebook, and a pleasant focus like a healthy green plant. Unfinished Business. If not a priority, this risks kicking around your desk top, making it untidy, and lowering your energy every time you look at it. Add it to your To-Do list, then store it in the top drawer, in a labelled folder. Computer Clutter. This can clog up your mind and make you feel stuck in a rut. How often do you stare at your computer wondering what to do next? You may need to add an extra hour or so to declutter your computer, but it’s well worth it for clearing mind-fog. So that’s it. About 2 hours to re-visit and re-arrange, then 5 minutes at the end of each day. Time well spent for clear thinking, an energy buzz, and some peace of mind. And if you want to know more about clutter clearing, and about effective, manageable tools for bringing the practice into your home and other aspects of your personal life, click here.